In a large skillet, heat 1 tablespoon sesame oil over medium-high heat. 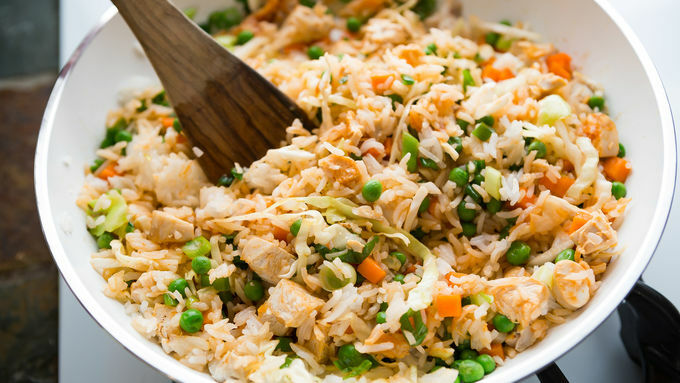 Toss in cabbage, chicken, green onions, peas, carrots, rice, oyster sauce and 2 tablespoons ketchup. Fry until the edges of the rice begin to turn light golden. In a large bowl, whisk together eggs, 1/2 tablespoon sesame oil, half-and-half and salt. Heat large skillet over low heat. Spray generously with nonstick spray. Pour half of the egg mixture into the skillet and gently swirl around until the bottom of the skillet is covered with the egg mixture. Allow to cook on low until the eggs are set. 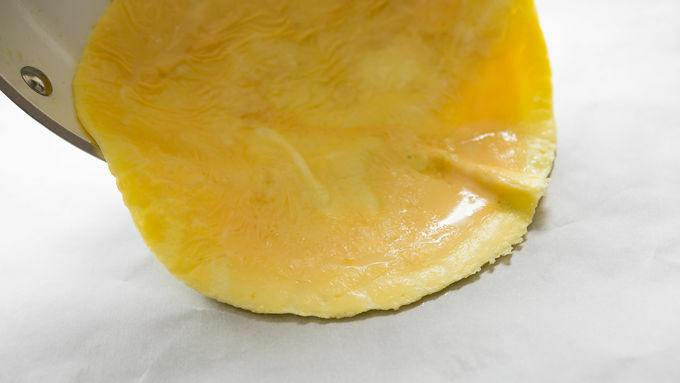 Gently slide egg onto a large square of parchment paper. Repeat with remaining egg mixture, so that you have two omelets. Place plates upside down on top of each soup bowl, and carefully flip to unmold the rice in onto serving plates. Gently flip the parchment papers to cover each rice mound with a sheet of cooked egg. 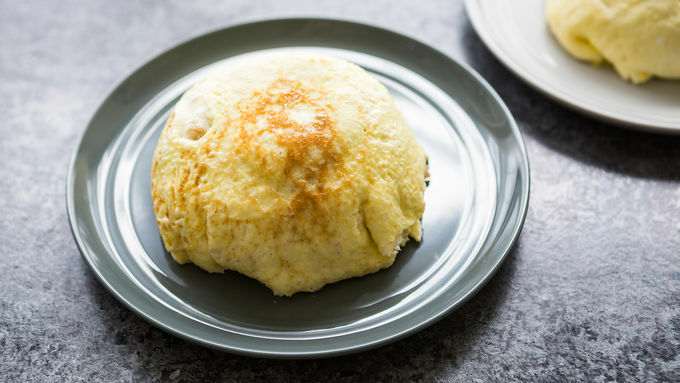 Use a butter knife to gently tuck the edges of the omelet beneath the mound of rice. Optional step: for an extra-precise look, spray the soup bowls a second time with nonstick spray and gently place over each mound of egg. Flip both egg and rice upside down into the bowl. 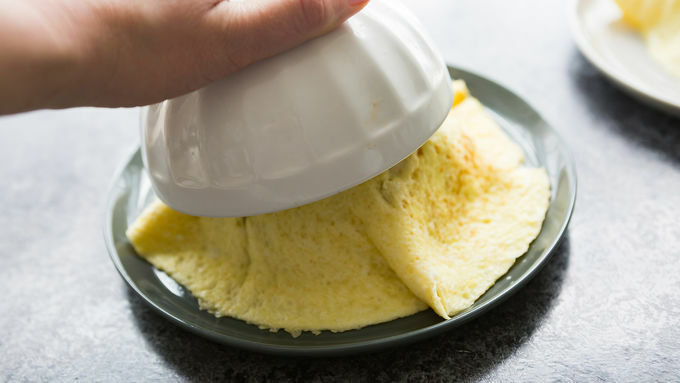 Fold the edges of the omelet around the rice, then unmold again onto serving plates. Drizzle each mound with ketchup and top with scallions before serving. Toss in 2 strips cooked, chopped bacon for added breakfast flavor. Ready-to-go rice can be found in the Asian or rice aisles of most supermarkets, or at Asian markets. 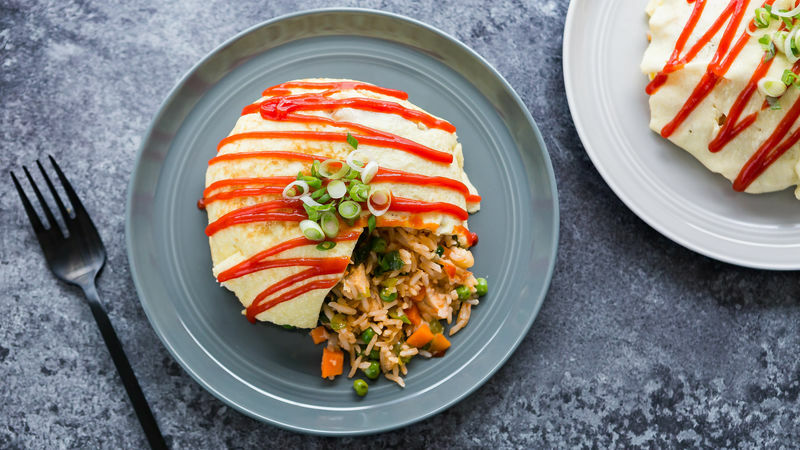 Considered “Western Food” in many Japanese eateries, Omurice is popular fusion favorite. Fried rice, topped with a crepe-like layer of eggs. Half omelet, half fried rice. Thus the name: “omu-rice.” If you’ve never tried this tasty comfort food, this version is a great place to start. 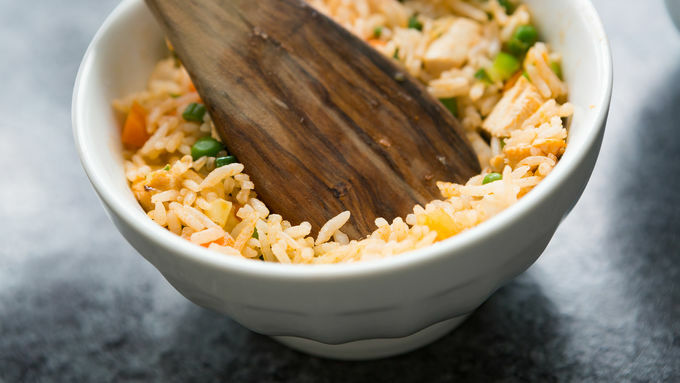 Using a skillet and soup bowls, you can create tasty little mounds of Sriracha ketchup-flavored chicken fried rice, blanketed with a tender soft-cooked omelet. The trick here is to fry the rice on high, and cook the eggs on low. We’ve walked you through each of the steps with specifics that should help. For instance, keep a can of nonstick cooking spray nearby (it helps throughout the whole process, making it easy to mold and unmold both the rice and the final Omurice) and don’t start the process until you have pieces of parchment nearby. As a note, Step 8 of this recipe isn’t necessary. 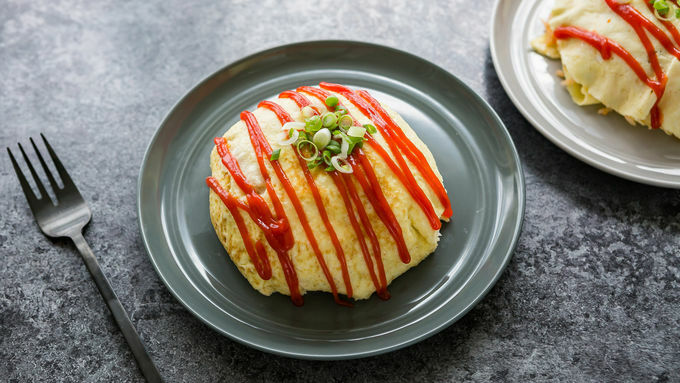 Many restaurants serve Omurice as a mound of rice topped by a blanket of eggs. 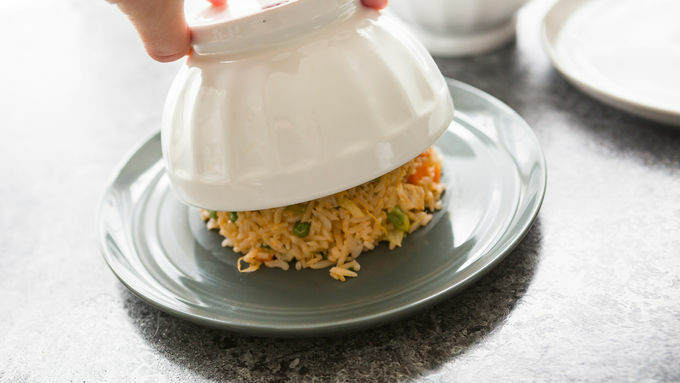 So feel free to skip the part where you flip the egg and rice back into the bowl to tuck in the edges before unmolding it onto the plate one final time. 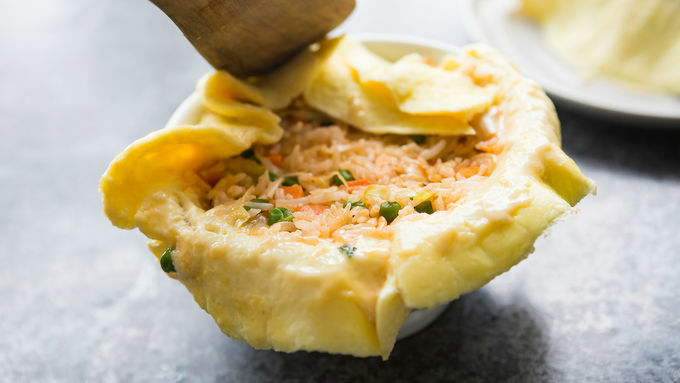 Sliding the omelets over the top of each rice mound and tucking the edges underneath with a butter knife tastes just as good, and saves you some time and effort. But if you’re looking for a perfectly precise egg-wrapped look, follow Step 8 closely. It takes a few more minutes, but the end result is as good-looking as it is tasty.